Sheamus has done it all in the sports entertainment business through his incredible career. He has been a prolific singles superstar and is now an integral part of the tag team division as a part of the Tag Team unit, The Bar. How did the whole idea of teaming The Big Show up with The Bar come about? 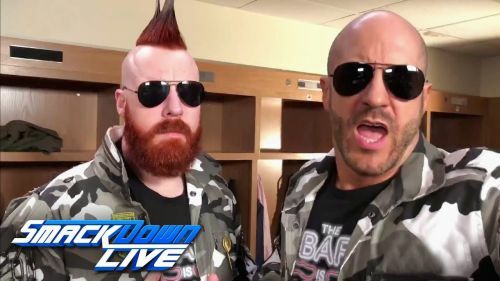 Sheamus: Show was like guys you're the best ever. And we were like 'Show, you're awesome. You're a future WWE Hall of Famer, an unbelievable athlete and we'd love to have you on board, you know!' That was the deal. How was it competing in India last year? Sheamus: I think you'll be hard pressed to find fans as passionate anywhere in the world as they are in India. It's incredible. I can't explain it. Indian people love WWE. They love wrestling. They love it. They're super passionate about it every time we go with their reactions. They come up to the airport, to the hotel, to the arena. Definitely one of my favourite places to visit. I've been to Jaipur, to Mumbai, a couple of years ago and it was probably one of the best experiences of my entire life. It's another reason why I love what I do. What did you think of Mandy Rose getting involved in your match against The Usos and all the drama surrounding Naomi and Rose? Sheamus: Is everybody still on the call? From all the other countries? Sheamus: Mandy Rose coming out last Tuesday in our match was probably the best run-in in WWE history. I want everybody to know that. Mandy Rose's run-in was the best run-in in all of WWE and all sports entertainment. That's what I want to say. For the record. What was your reaction when you found out that you'll be taking on a ten-year-old boy called Nicholas at WrestleMania 34? Sheamus: Well, we didn't know until we came into the ring. Probably lost because of that because we thought we didn't want to hurt a ten-year-old kid. Braun Strowman is a coward because he knew we'd never lay a finger on the ten-year-old kid. So, Braun Strowman is a coward and that's the real story there. Never would have laid a hand on that kid. Just like Braun beat up Vince's limo so that he could get taken out of the match, instead of bowing out of the match. Catch Sheamus every week only on SONY TEN 1 and SONY TEN 1 HD. Be sure to catch the Royal Rumble on these channels too.